The MV Aurora is a modern 42 m vessel that is well equipped with a plethora of state-of-the-art features and the latest safety measures. Guests can relax on board in comfortable and spacious cabins, and in equally luxurious and expansive public areas. 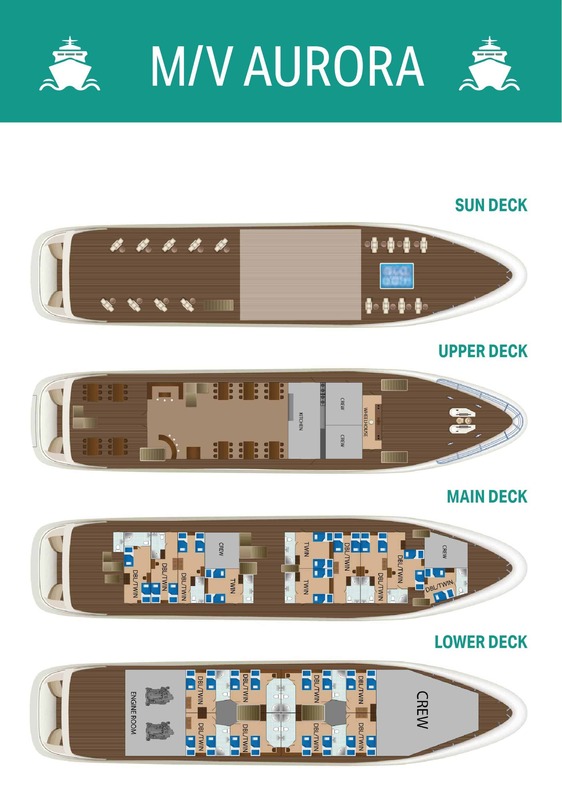 The 19 air-conditioned en suite cabins offer flexible twin and double bedding configurations, and are arranged over the upper, main and lower decks. There is an elegant air-conditioned salon-restaurant, a bar with extended and comfortable alfresco lounge, and a large sun deck that features a Jacuzzi and an array of sun loungers and deck chairs. The MV Aurora was built in 2012 to the highest standards featuring the latest and greatest amenities. This modern vessel is sure to impress, as a favorite for cruising the Adriatic, providing a small-ship experience with a capacity of just 38 passengers in 19 spacious, en-suite cabins, guaranteeing the utmost in comfort as well as a high level of personal service, provided by every member of the crew. The 42 m MV Aurora showcases the latest state-of-the-art equipment and safety features to ensure that all guests enjoy the ultimate intimate small cruise experience. The 19 air-conditioned en suite cabins are arranged over three decks and provide a comfortable, spacious and luxurious private space in which to relax and unwind. The communal public areas of the ship are ideal for socialising, and include an elegant air-conditioned salon-restaurant that seats all guests in a single sitting, a bar with outdoor lounge, and a large semi canopied sun deck that boasts a Jacuzzi. 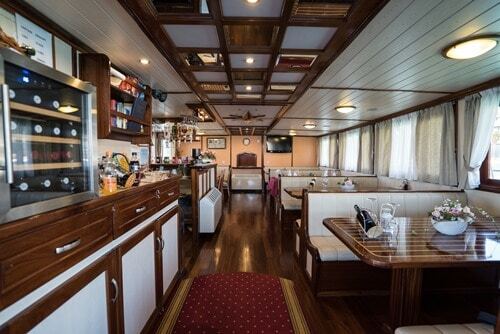 The public areas of the MV Aurora invite guests to relax, socialise and mingle. The large partially shaded sun deck boasts an array of strategically positioned sun loungers and a relaxing and pampering Jacuzzi. The bar extends outside to a comfortable lounge area where guests can sit and enjoy chilled drinks throughout the day. The elegant air-conditioned salon-restaurant is where freshly prepared buffet breakfast and half-board meals are served. The spacious and airy salon-restaurant features panoramic windows to ensure that diners never miss out on the spectacular views. All guests can be accommodated in a single sitting.